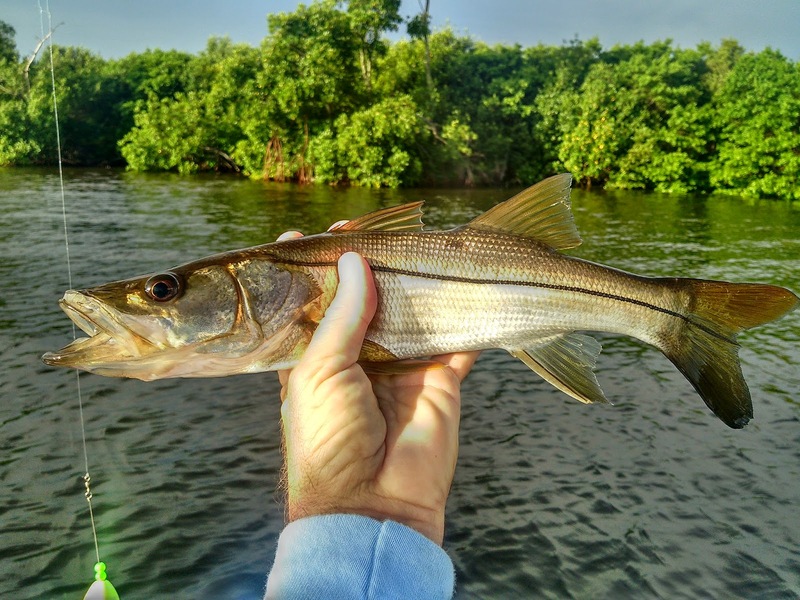 Right now you can catch juvenile snook like this guy on just about every shoreline in Matlacha Pass on the east side of Pine Island. A live shrimp under a cork will pull them and if you're chumming with whitebait you can catch them by the dozens on some of the deeper holes next to the mangroves. Getting a snook that's actually in the slot is a serious chore though, at least it has been for me this season. I haven't seen too many other folks cleaning any back at the Matlacha ramp either and that's actually not a bad thing. I'm convinced that our snook population is in fine shape since the 2010 freeze and in a few years we'll see an explosion of slot-sized or larger fish. I probably won't get to eat one this year but that's not the end of the world, we've got plenty of trout and reds to keep the grill busy. For now I'm keeping my 1/0 Owner hooks debarbed and enjoying the strikes from these juveniles.